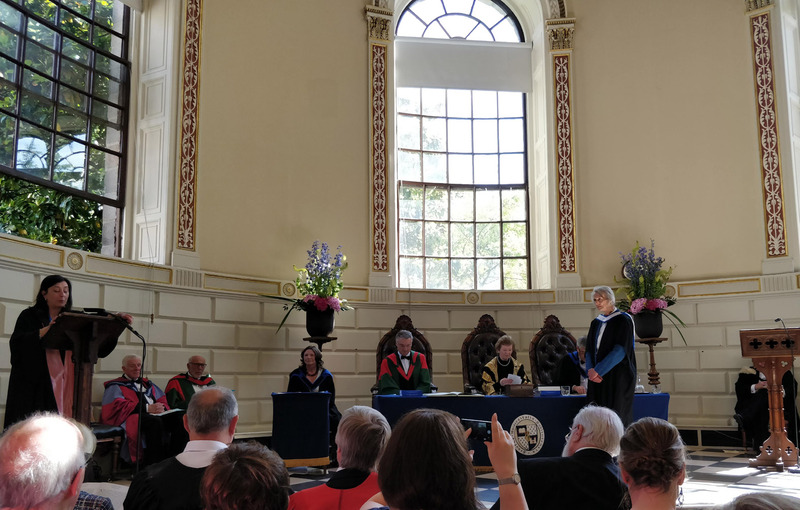 The Commencements was presided over by University Chancellor Mary Robinson in the presence of Provost Patrick Prendergast. 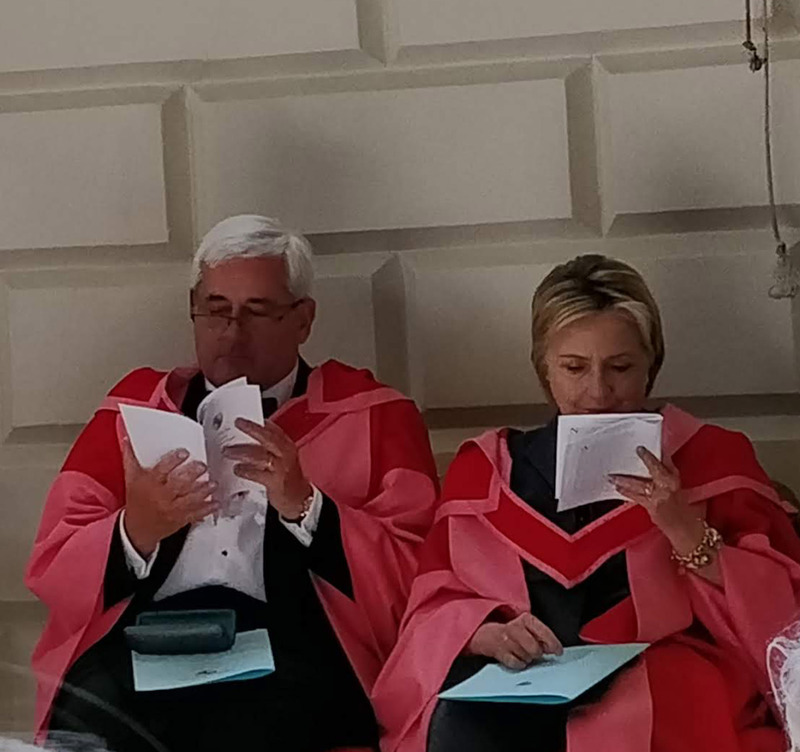 Other honorary degree recipients included Tony Scott, James Simons, Senator Hillary Clinton and Paul Drechsler. 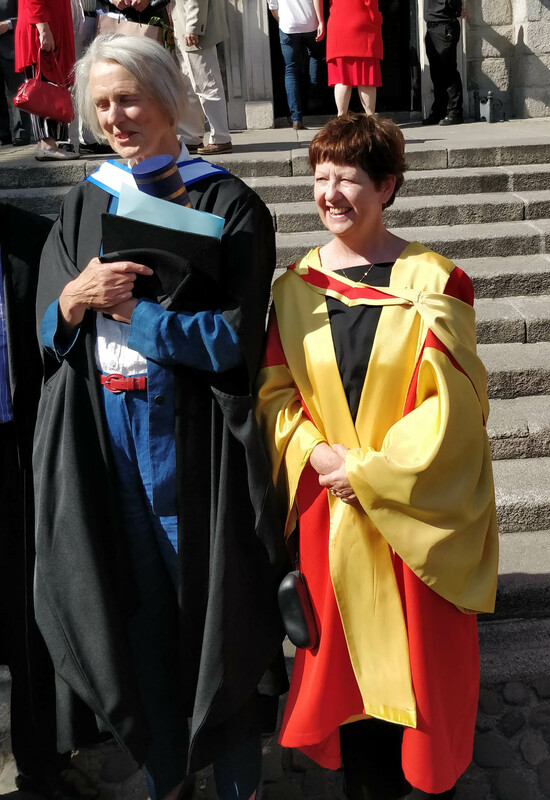 The Archive staff attended, as did Chairman Michael Webb and his wife Melissa. 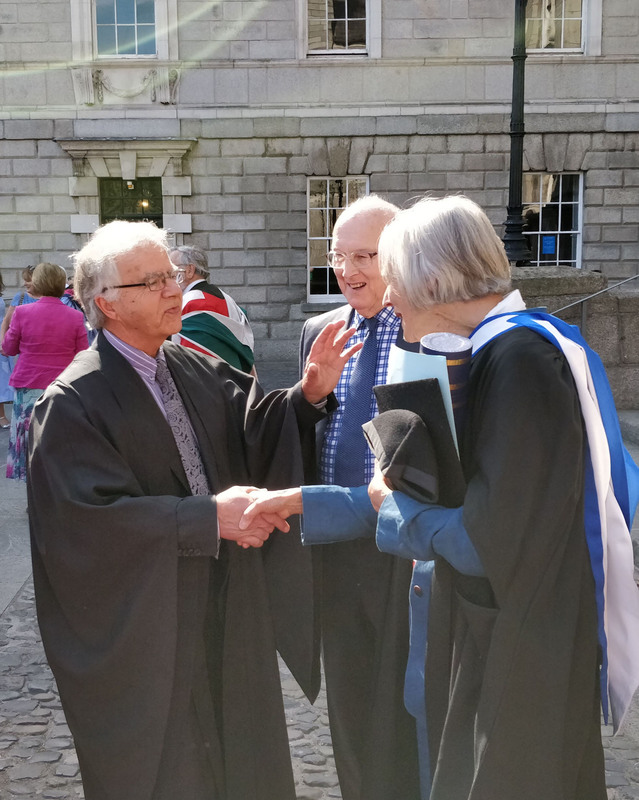 Both the Archive’s Honorary Presidents – Edward McParland and Nicholas Robinson – were also there. 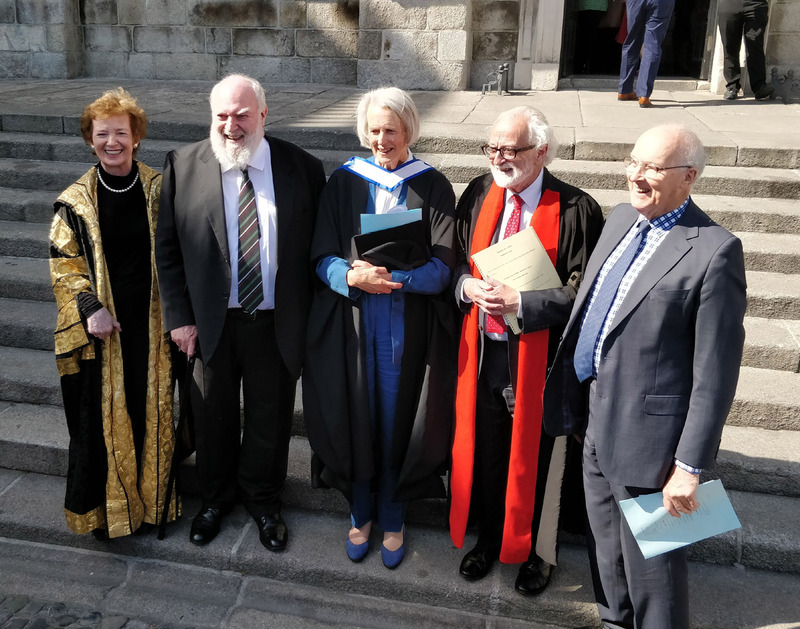 College Public Orator, Professor Anna Chahoud, delivered an encomium in Latin, part of which read (in paraphrase): ‘If you search for a modern account of Irish architecture, you will find none worthier of reverence than the work of Ann Marta Rowan, faithful historian of the Irish built landscape. Of gentle, modest, retiring nature, she has erected an imposing monument, achieving for the country what Sir Howard Colvin did for British architecture… On coming to Ireland, she has worked for over thirty years (and still works) in the Irish Architectural Archive, the splendid temple to Irish architecture erected in Merrion Square forty-two years ago, with which the College has such close connections. 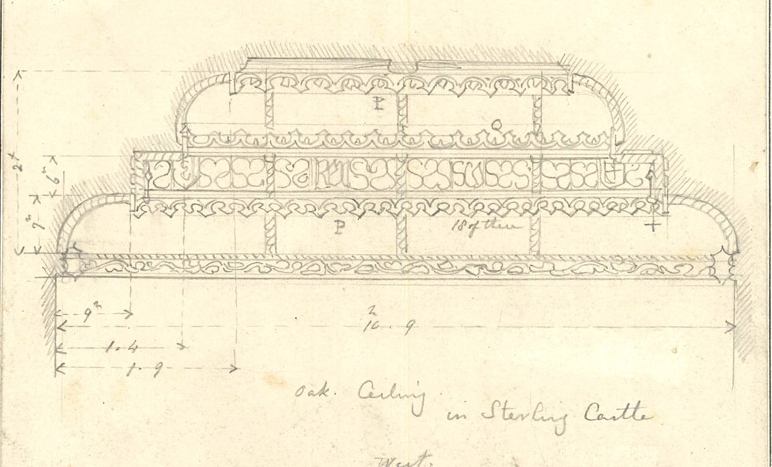 It was in the Archive that she came upon the treasure left by the eminent architect Alfred Gresham Jones. She transformed , and enormously enlarged, that wealth of material into a detailed, accurate, comprehensive biographical index of architects, builders and craftsmen, covering nearly fifty thousand buildings in our island. 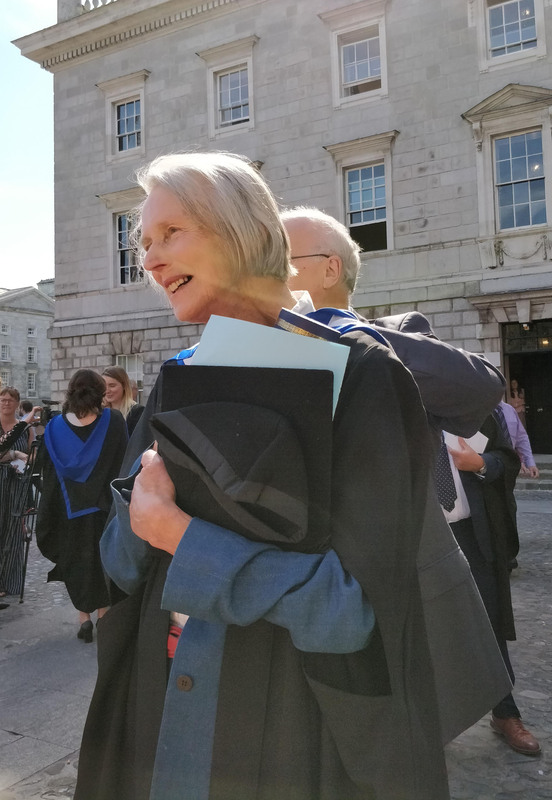 The Dictionary of Irish Architects 1720-1940 is not only immensely authoritative; it is a democratic masterpiece of Digital Humanities… In recognition of her faithful and generous service to the country, the University is proud to bestow on her the title of Master of Letters’. This exhibition consists of thirty-one drawings, shown either singly or in pairs within the one frame. 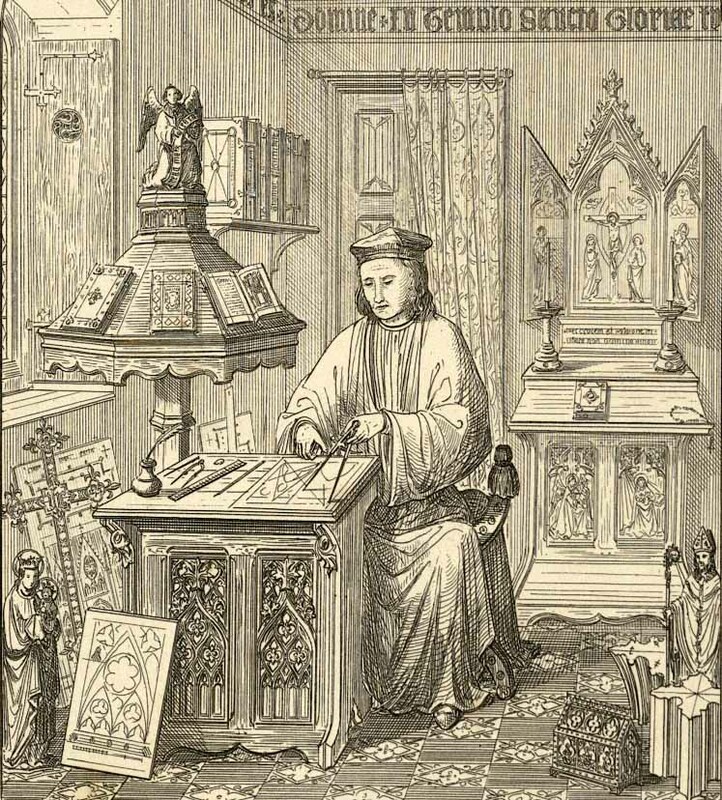 There are also copies of two of the books published by Pugin, firstly The True Principles of Pointed or Christian Architecture of 1841, with a highly romanticised picture of a medieval architect at work within his study, where a Gothic house-altar stands behind him, and chunks of tracery and ecclesiastical bric-a-brac lie cluttered at his feet. The second book, of 1843, is open at the celebrated frontispiece of fifteen of the architect’s own most creative designs for churches. Pugin was always a polemicist. Think of the absolute irony implicit in that second title, thought up by a young man of thirty-one: An Apology for the Revival of Christian Architecture. Why on earth should an architect in early Victorian Britain feel the need to apologise for encouraging the revival of Gothic architecture, particularly when the scales are weighted in its favour by singling Gothic out as the only logical style for people of any religious faith and by calling it Christian. Pugin was also a brilliant self-publicist who never minced his words. The new Classical churches built throughout Ireland, after Catholic Emancipation and before the Famine, were castigated by him as pagan, and he described buildings like Dublin’s Pro-Cathedral, Longford Cathedral, and St Mary’s Dominican Church, Cork, as simply ‘the vilest trash’. That did not make him popular with the clergy in Ireland but it gave grist to his architectural campaigns. ‘My writings much more than what I have been able to do have revolutionised the taste of England’ he wrote to his friend and business associate John Hardman in Birmingham in 1851, just one year before his death at the age of forty. 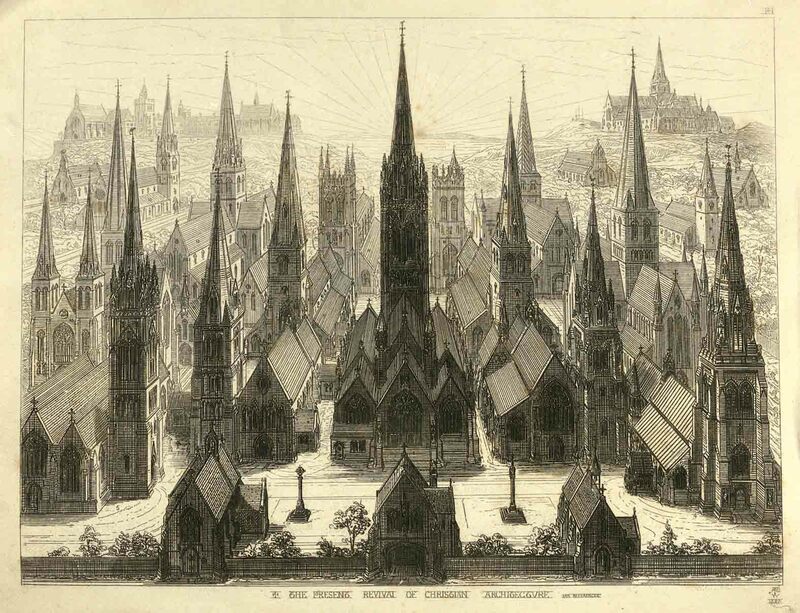 In 1851 the Medieval Court at the Great Exhibition in London, bursting with examples of his designs, had been a runaway success and it was Pugin’s meticulous Late Gothic details that were even then clothing the entire fabric of the new Houses of Parliament at Westminster. How did he achieve such dominance? 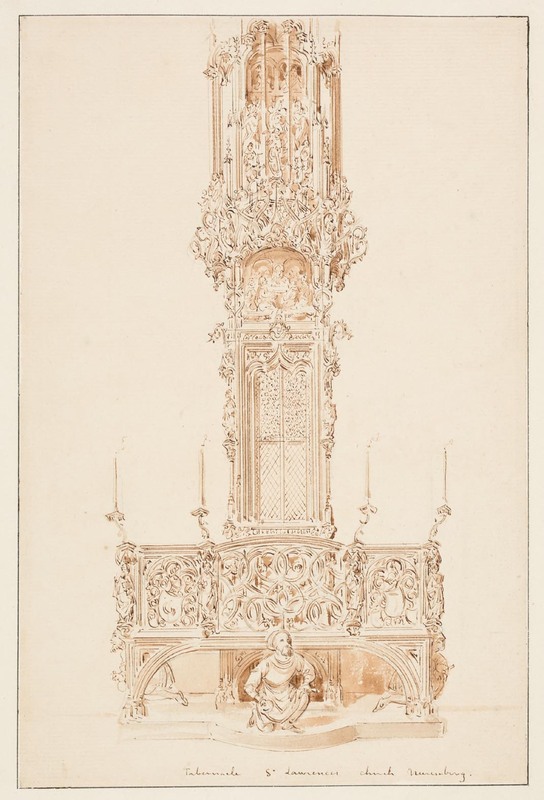 This exhibition of a small but choice selection of the architect’s sketches prompts at least two answers: firstly there is the indomitable energy at the root of Pugin’s character which led him to make drawing after drawing of medieval architecture wherever he went and secondly there is his capacity for looking analytically at whatever he chooses to study. 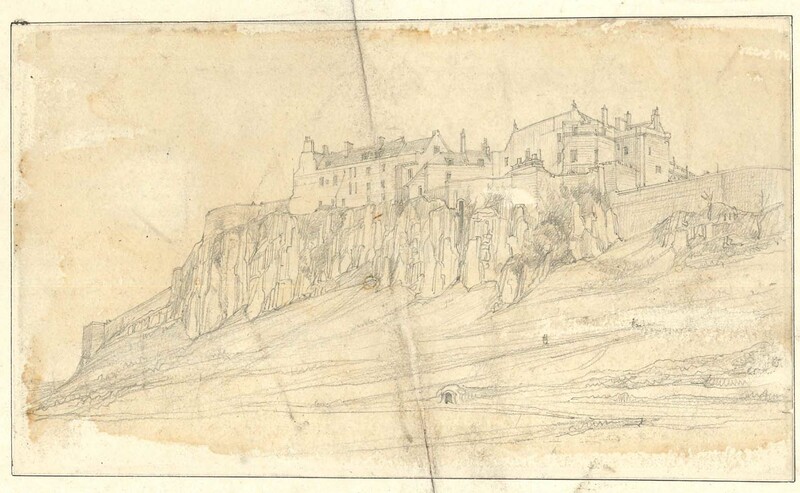 We may note these characteristics at least twice in the exhibition: first when Pugin visited the royal castle of Stirling in Scotland – a building which he records first in two neat topographical views, drawn in pencil, showing the bulk of the castle rising above the volcanic outcrop of rock on which it stands and, in a second view of the approach to the apartments of King James V. These drawings give a sense of the whole building but Pugin also took time to analyse a rectangular oak ceiling in detail, making a plan and sectional elevation of its design and expanding his understanding of the construction by very precise and accurate drawings of the carved decoration and lettering set into the ceiling. I have the feeling that he must have got someone to lend him a ladder since he notes precise measurements taken from the high cove of the ceiling at the top of the room and he could not have drawn the details of the carving without close access. Now this is the important point. The detailed knowledge that Pugin acquired of actual examples of Scottish medieval joinery in this way would immediately inform the decoration of two Gothic libraries at Duns Castle in Berwickshire and Taymouth Castle in Perthshire for both of which he supplied designs. The effect of these rooms was rich, new and stunningly authentic. No wonder Puginian Gothic met with approval and encouragement. 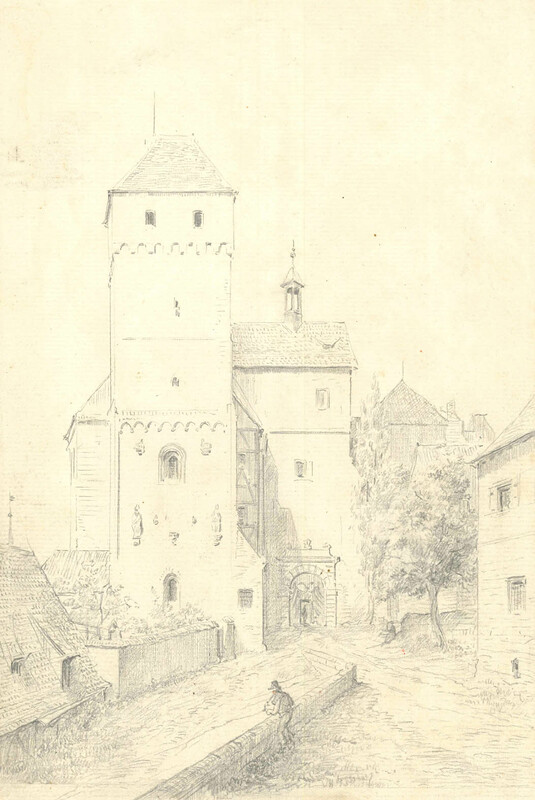 Nuremberg is the second site widely recorded in drawings now held in the Irish Architectural Archive. Pugin visited the city in the summer of 1838. It is a wonderful medieval town, which must have delighted him. At that time the circuit of the defensive walls was marked by no less that eighty-eight interval towers of which, even after the Second World War, fifty-seven remain. There are handsome pictures in the exhibition of two of the interval towers one of which, up beside the castle, has a Romanesque chapel incorporated at its base. Much the most famous of the late medieval buildings in the city is the Church of St Laurence to which a soaring late Gothic choir, with star-ribbed vaults, was added between 1439 and 1477. A ladder would have been no use to Pugin here yet he was instinctively drawn to record the astonishing pinnacled tabernacle, which abuts one of the eastern piers in the choir. This is not a tabernacle, as we understand the word today, but an extensive Gothic balcony on which at least ten people might stand with a tiered canopy of filigree Gothic pinnacles containing scenes from the life of Christ and rising the full height of the vault. Soaring to more than eighty feet, I can hardly imagine how Pugin drew it: looking up high to see what he had to draw and then shifting his focus to the sheet of paper – back and forwards again and again. He had to split his drawing between two pages to fit the whole monument in. The tabernacle is the work of the master sculptor, Adam Kraft who took three years to complete it in 1496. 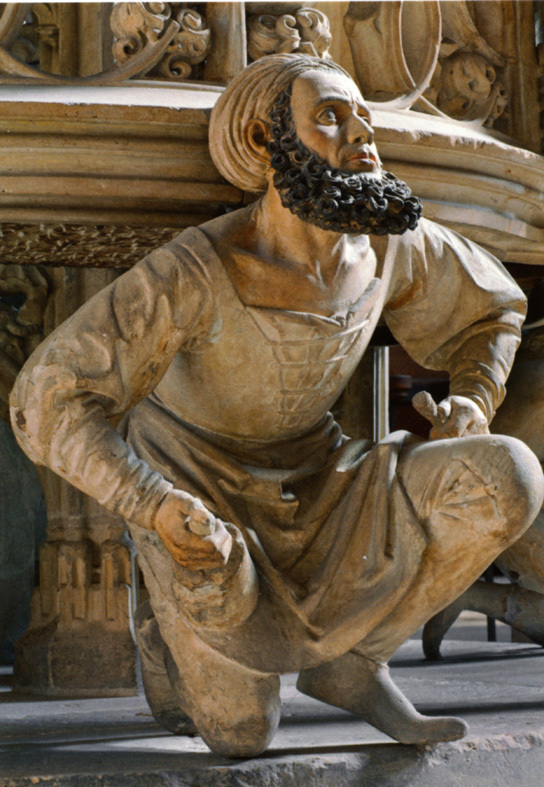 Kraft is a leader among German Renaissance realistic sculptors, a man of brilliant imagination who, in a wonderful stroke of bravura, placed a life-sized figure of himself, with jutting black beard and a mason’s mallet and chisel in each hand, crouching beneath the centre platform of the balcony to give support to it. Pugin catches all these details as well as the filigree spire. Like a lot of architects he was not very good at drawing people. 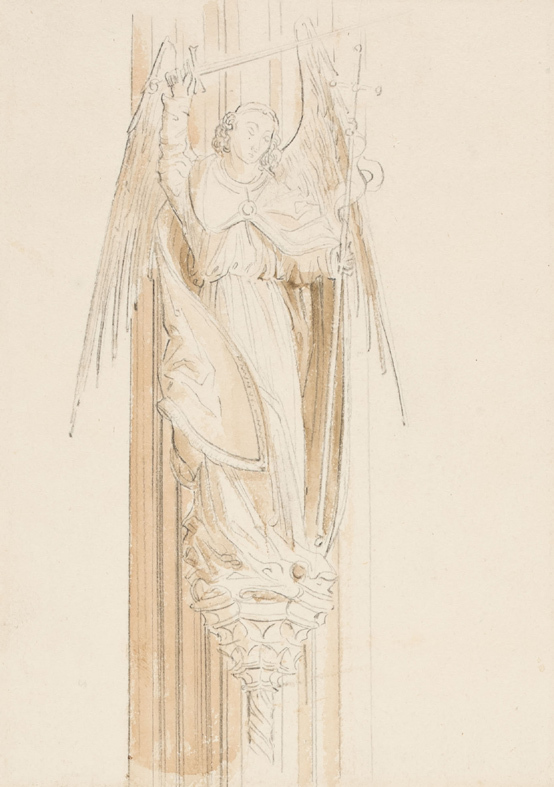 The figure of Kraft is unconvincing in Pugin’s sketch, and his attempt at the ‘Schone Madonna’ of 1285, a beautiful figure of the Virgin and Christ Child on a bracket in the nave, has none of the grace of the original. The statue of the Archangel Michael in Pugin’s hands becomes an awkward jagged figure with angular wings and an unwieldy sword. Even so, if he was better at drawing buildings than bodies, critics from his own time to the present day have always admired the fluency and facility of Pugin’s hand. Whether he is drawing with a finely sharpened pencil as at Stirling, or in sepia ink touched lightly with wash as at St Laurence’s church in Nuremberg, Pugin’s line is never dead. It has the quality of a life of its own, strong and firm in one place – even emphatic – so that at times the pencil almost bites into the paper or the ink is full and dense, only to fade to a fragile line which is allowed, at times, to die away completely the better to model the forms on the page. David Hockney in a different age is a master of this same sort of graphic economy. 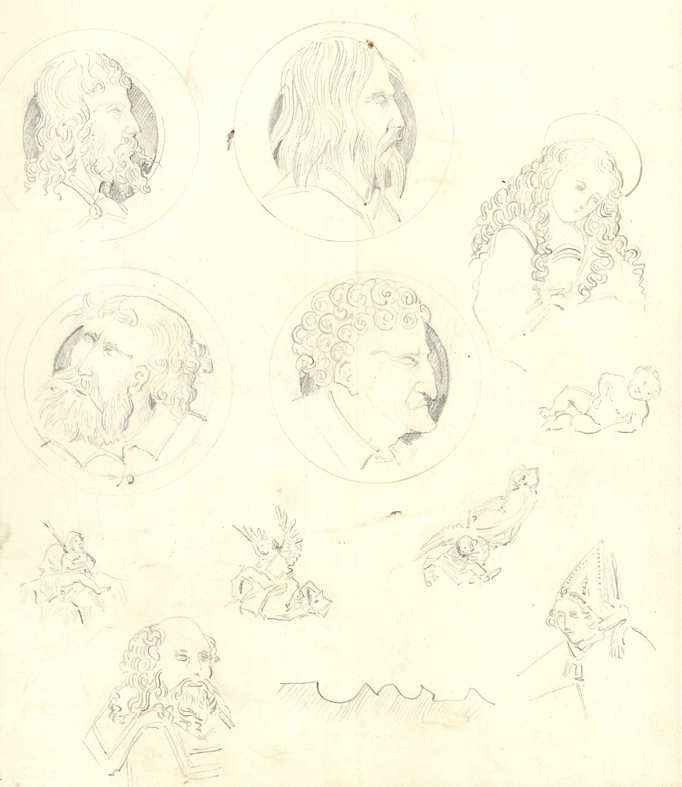 We can see it particularly well in Pugin’s drawing of a number of figurative corbel stones from Stirling Castle or in the curious studies of decorative portrait heads set within circular bands whose source is unknown. This is rapid, un-laboured draughtsmanship, employed with urgent immediacy by a man who never seemed to rest. We should remember however that Pugin could never have expected that these slight drawings would be put on public display. For him, they were simply part of the office equipment, essential as source material to feed into – or perhaps at times to nudge – his creativity. Two hundred years earlier Rubens had used his own collection of drawings, thematically arranged, in exactly the same way. For both artists the drawings were a means to an end, not an end in themselves. It was Pugin’s intention to revolutionise attitudes to architecture in Great Britain and Ireland and in large measure he succeeded in his objective. Outside the Architecture Gallery room and hanging in the stair hall of the Archive is a large gilt-framed perspective drawing of Cobh Cathedral designed by his son, Edward Welby Pugin then in partnership with Pugin’s son-in-law George Ashlin. 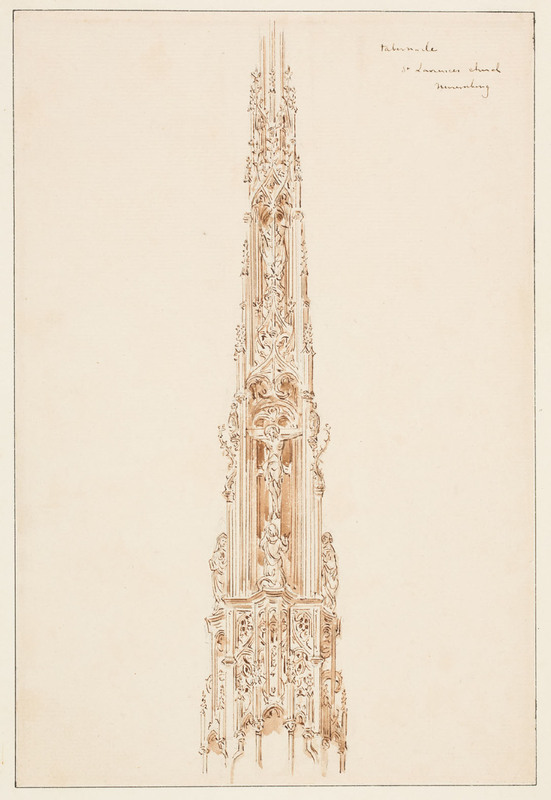 Below it on a table in the hall is an architectural model of Rawson Carroll’s big Gothic church, with its splendid broach spire, built at Leeson Park, Dublin, for the Molyneux Institute. Each of these Irish churches is a confident, strong design of real authority. The fact that so many buildings of this character were to be built everywhere in Ireland in the second half of the nineteenth century signals, unequivocally, the triumphant conclusion of Pugin’s personal crusade. 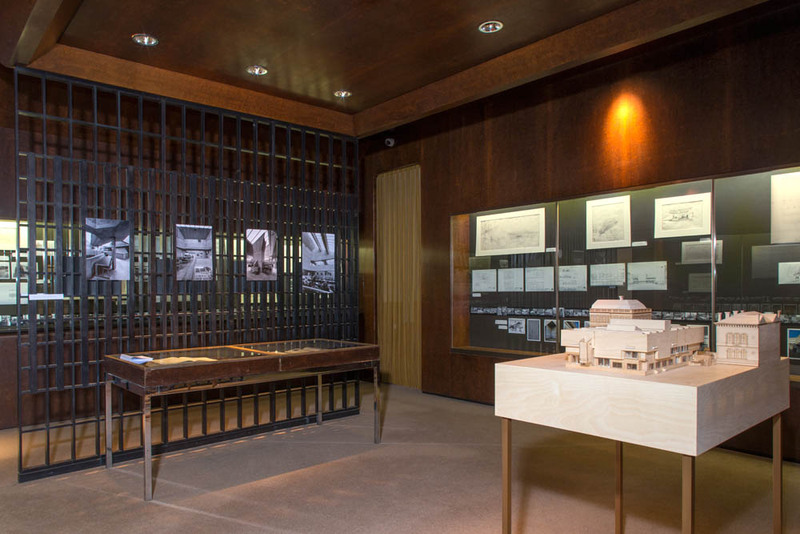 The following essay is by Anthony Kelly, Seán McCrum, Paddy Sammon and David Stalling, the curators of the Memorialising the Sacred exhibition running in the IAA Architecture Gallery from January to April 2018. 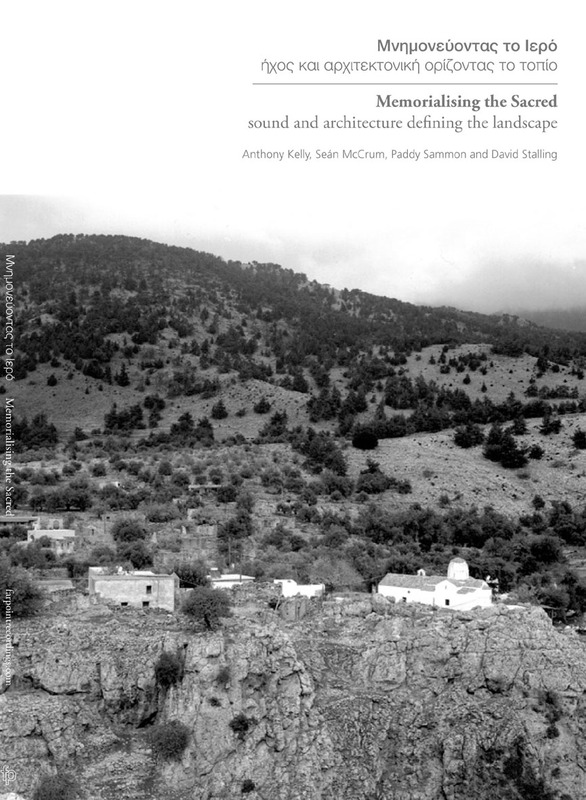 It is from the publication Memorialsing the Sacred: sound and landscape defining the architecture (Paddy Sammon ed., Farpoint Recordings, 2018) and is reproduced here by kind permission of the authors. One evening, during sunset, we went for a walk along the road from Anópoli to Limniá. There is a junction after about 20 minutes, where a side-road turns right, and a wayside shrine at the corner. About 300 metres from the junction, we saw a car turn into the side road and stop for a minute, then drive on. We were curious and continued walking. The driver had lit the lamp in the shrine. Its lightmade the shrine a marker of the junction at night. The shrine was important for this individual, defining this junction not just for the driver, but for whoever came past. To an outsider these shrines and churches may seem to be situated in the countryside for no identifiable reason. However, no building exists for no reason. Why is a church or shrine here? Why not somewhere else? Visiting Loutró and Anópoli, we went hill-walking and kept coming across small churches and wayside shrines. We began to ask why these structures are at particular places. Their number and positioning made Loutró and Anópoli particularly rich resources for answering our question. There are two types of church. One at the centre of a village. The other an “outside church”, placed at the edge of a village, in the countryside or on the seashore. The second type may define the boundaries of a village or the point where two villages’ lands meet. They may also act as visual pointers, related to pathways in use before roads were built. A church made clear that a village was nearby and also defined its presence. A church on the shoreline or hilltop can act as a marker. It could be built to repay a vow. Others are positioned close to late-Roman or Byzantine ruins. In some cases they incorporate a basilica, or may be close to a Roman tomb. They may not project precise knowledge about these buildings, but a sense of the importance carried by a ruin and its role as part of a Christian structure. Wayside shrines frequently incorporate some or all of these elements. They were also often built to repay a vow, to show a place where danger was avoided, or where something bad happened. The shrine defines how individuals and their community see their relationship to a particular place, such as the junctions of paths and roads, which are unlucky places. Although we have visited Loutró and Anópoli several times, we are outside observers of country churches and shrines and their role in their locations. We agreed to make a creative project from our perspective, different from that of local people. It involved transmuting our experience in those places to a different place, the Gallery of the Irish Architectural Archive, with its own strong persona, which determined our thinking on presenting the experience of these villages. We needed the visual as well as sound, since both were parts of our experience of the places, and worked with black-and-white medium-format film, to state the visual presence of country churches and shrines. Such images make it clear that these are photographic, two-dimensional records of experience. Colour is now too close to replicating and, by implication, imitating a place. Recordings were made in and around where photographs were taken, then used to make a sound composition. Some small objects were also incorporated. 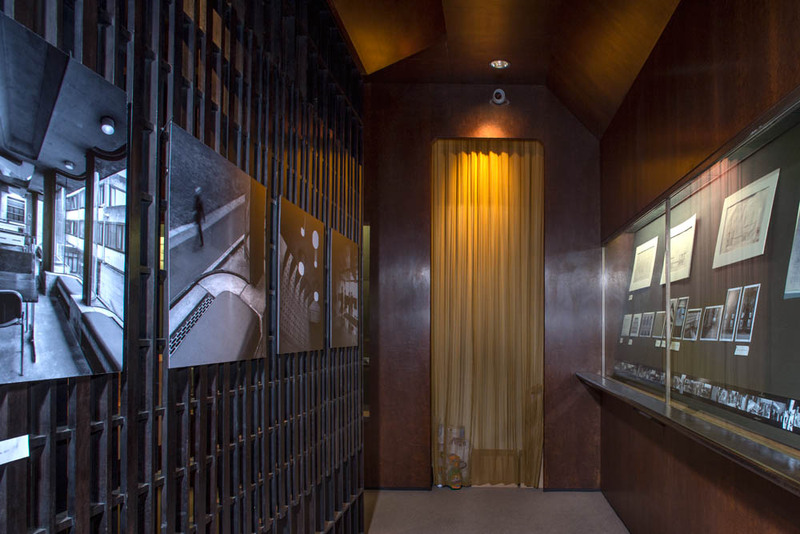 The three dimensions and architectural presence of the gallery incorporate the two dimensions of photographs presenting objects; sounds add an additional dimension; the objects respond to the physical three dimensions of the gallery. These churches and shrines have a complex role in defining where they have been placed. They are at the centre of how people define themselves and where they live. It is important not to perceive them as disparate objects, but as part of a network of how people relate their presence to their place. For us, they also provide a different point of definition in our experience of Loutró and Anópoli. 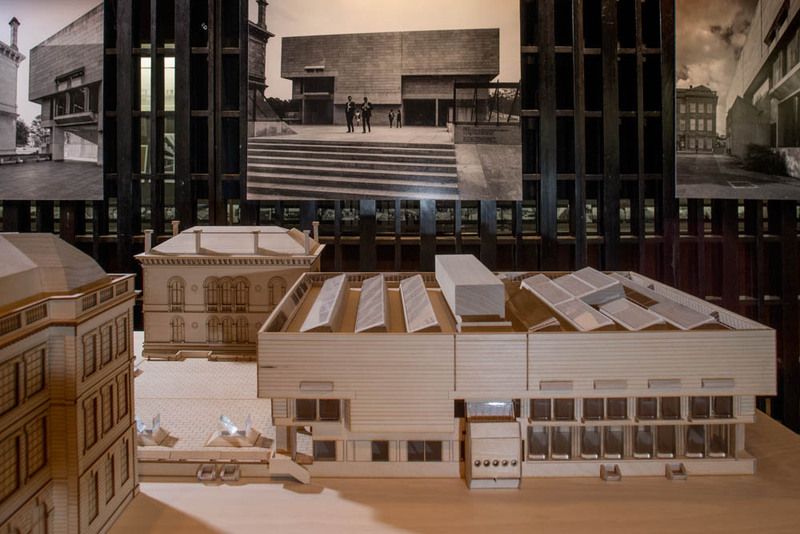 Donal Hickey discusses the Berkeley Library exhibition which he curated in the Irish Architectural Archive’s Architecture Gallery. The exhibition runs until the end of the second week of January 2018. The concept for this exhibition began with discussions with Dr Ellen Rowley when she asked me to look at some material on the Berkeley Library at the Irish Architectural Archive. There I found a small box containing over 280 black and white photographs which begged to be displayed. The images document the progress of a New Library at Trinity College, designed by Ahrends Burton Koralek (ABK) and constructed by G & T Crampton, between 1961 and 1967. From the beginning I discussed this photographic record as a continuous timeline around which a narrative could be constructed to document the evolution and progress of the design and construction of the New Library. The Architectural Gallery is a room I am familiar with from my time working in London. It had a previous existence as the lining of an exhibition room in the Royal Institute of British Architects at Portland Place. A neat symmetry offered itself as I could now revisit my experiences of London architecture while interrogating the origins and influences legible, explicit or implied in the Berkeley library and the archives at the IAA and Trinity College. The presentation of this exhibition is intended to be open-ended for you the audience to imagine other connections beyond those illustrated. Even now as I write I am adding other clues and references which might assist a more complete reading of the design process and its complex influences. It is not hard to imagine the fervour and intensity of ABK’s collaboration which is evident in the final building and explicit in the selection of sketches and drawings of various versions of the project. Architecture is their gift: a silent legible mechanism, a conduit for our experience. As in the game of chess, where the knight’s move allows a piece to move in an unorthodox fashion relative to the other pieces on the board, combining the orthogonal and diagonal directions to shift across both plains, the Berkeley tilted the spatial game in Trinity College, introducing a dynamic relationship with the traditional order of the campus. 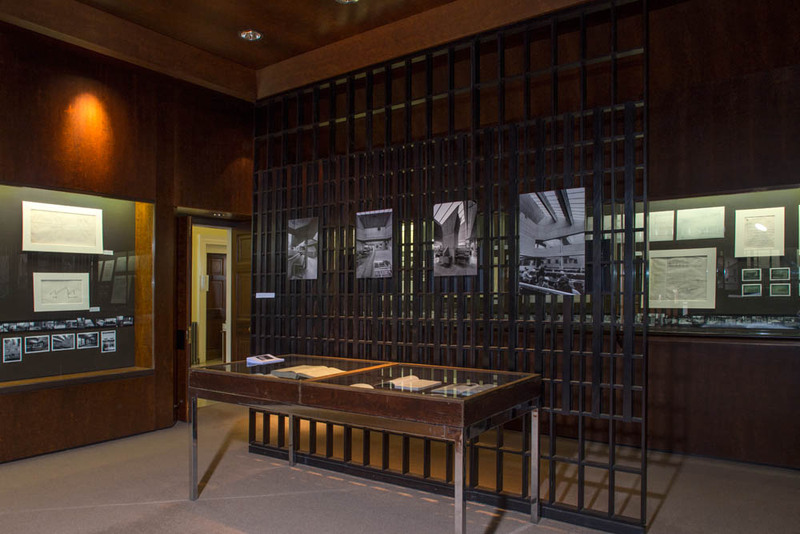 The Berkeley Library exhibition continues in the Architecture Gallery, Irish Architectural Archive, 45 Merrion Square, until Friday 12 January 2018. 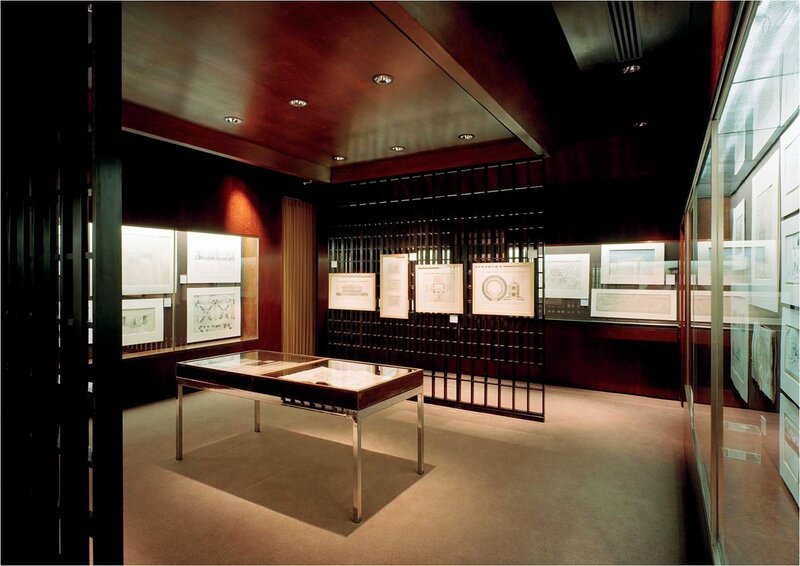 The Architecture Gallery is open to the public from 10 am to 5 pm, Tuesdays to Fridays. 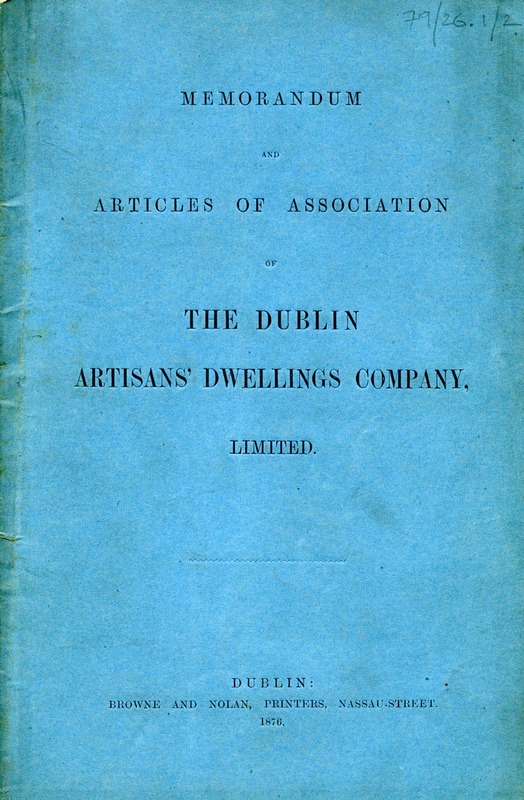 The Dublin Artisans Dwellings Company was a semi-philanthropic private enterprise established in June 1876 to provide quality housing for the city’s working classes, and to make a profit while doing so. Capital raised through share issues and Government loans was used to build houses. The rents collected – and the Company’s rents were always considered high – were used to repay the loans, maintain the building stock, pay dividends to the shareholders, and remunerate the directors. The Company’s earliest developments were blocks of one- or two-roomed flats but it quickly concluded that flats, though cheaper to build, were less popular and therefore less profitable than individual houses. 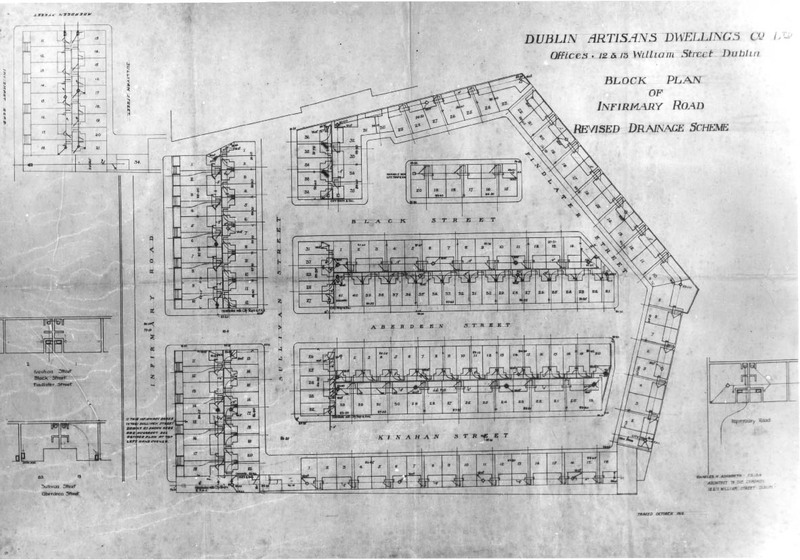 Most of the Company’s schemes consisted of terraces of single-storey cottages and two-storey houses laid out in groups of parallel streets, a template readily followed by Dublin’s municipal authorities and hence one that came to characterise whole areas of the city well beyond the boundaries of the Company’s activities. 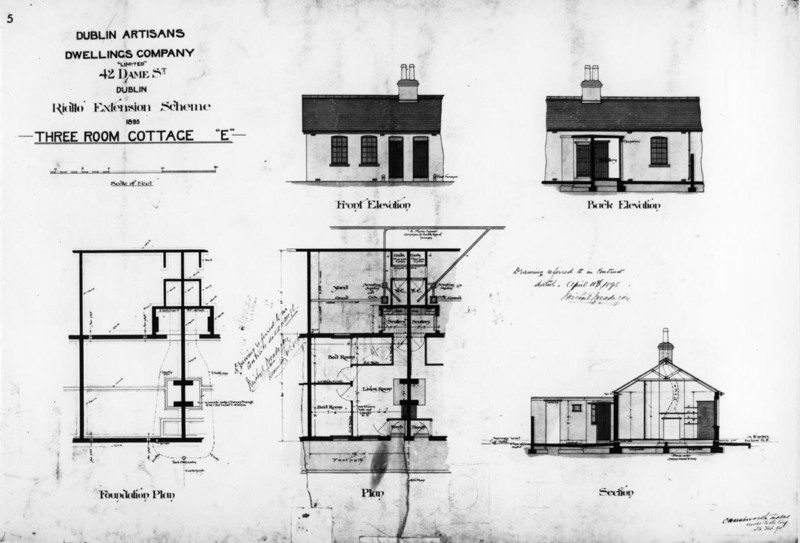 To control costs and speed of construction, a small number of common house designs was used across the Company’s schemes. The simplest house, designated Type A, was a two-roomed cottage with one fireplace and was in use from the early 1880s to the late 1890s. 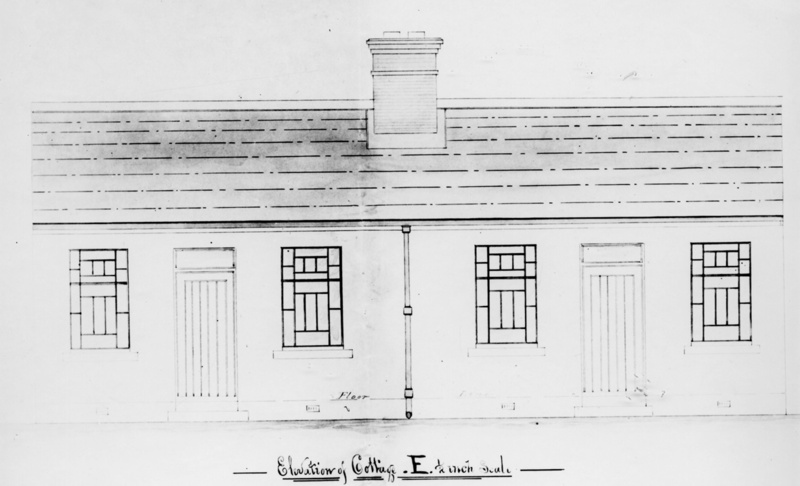 The Type E cottage, a three bay, three roomed (living room and two bedrooms) single storey dwelling was the most common of all house types constructed by the Company, used in at least sixteen separate schemes from 1883 to 1909. The outbreak of World War I interrupted building activity, a hiatus prolonged well beyond the end of the war by a protracted rent strike. Three further schemes were built from 1929 to 1933. The basic dwelling had now evolved into an eight-roomed house with a kitchen, an internal bathroom, front and back gardens and mains electricity. Citing what it regarded as unfair competition from local authorities, who were now providing working-class housing irrespective of profitability, the Company found itself unwilling to develop further schemes after 1933. In 1961 it adopted the policy of selling off its houses and using income generated to invest in purely commercial property. The last of the houses were sold in 1979 and the Company, by now renamed D.A.D. Properties Ltd, was taken over by Rohan Holdings in 1984. 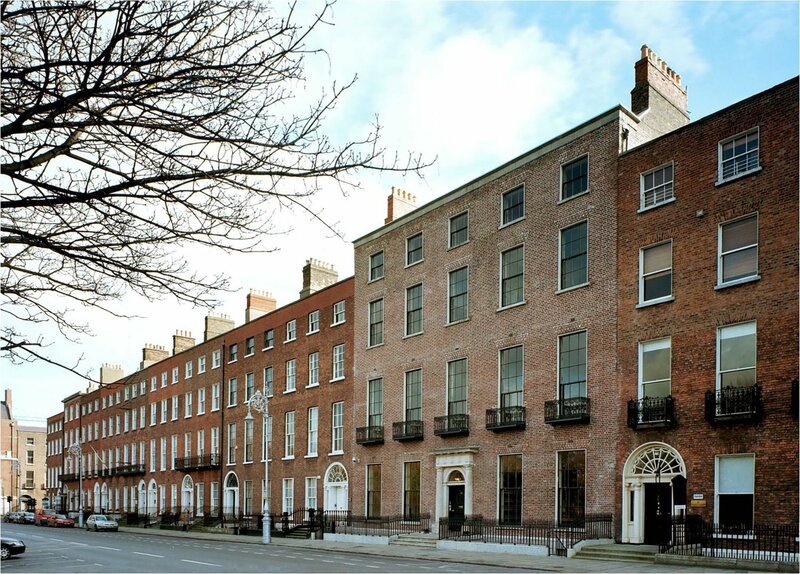 Between 1879 and 1933, the Company built 3,600 dwellings in over thirty major schemes across Dublin City, in Dun Laoghaire and Bray, most of which survive in use to this day. They constitute a legacy of distinctive neighbourhoods and communities established and sustained though the provision of decent housing. The business records of the Dublin Artisans Dwellings Co. were acquired by the Archive in 1979, with a second tranche arriving in 2000. Photographs of the Company’s architectural drawings were acquired in 1990, while dozens of the original drawings, once presumed destroyed, were deposited with the Archive by the Military Archives in 2015. 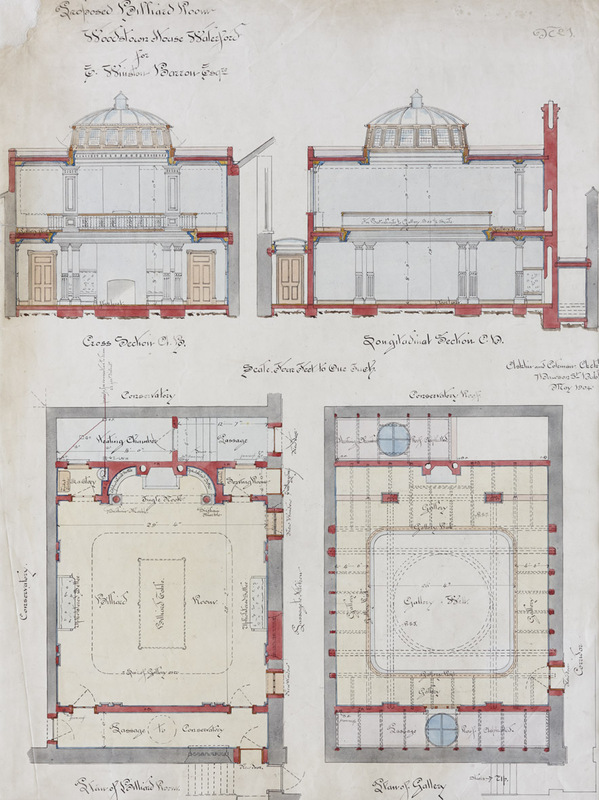 In 2016 Greg Dunn loaned for copying an original drawing for a C type house in Dun Laoghaire. 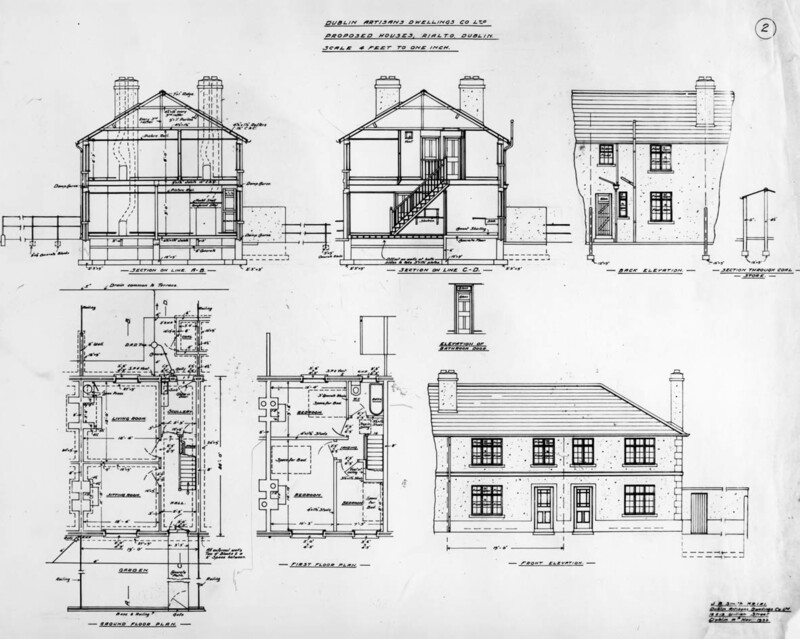 Most recently, in 2017 a series of files from the early 1960s to the late 1970s detailing the sales of individual properties was acquired via the National Archives of Ireland. This latest acquisition will soon be incorporated into the main collection catalogue which is available here. Woodstown House is an elegant Regency villa overlooking Waterford harbour. 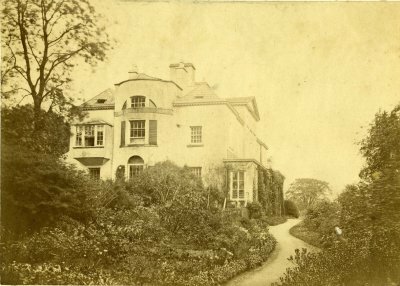 It was built, or rather an earlier house was substantially altered, in 1823 by Robert Chapland Carew, later first Baron Carew, as a present for his wife, Jane Catherine Cliffe. The architect was George Richard Pain. 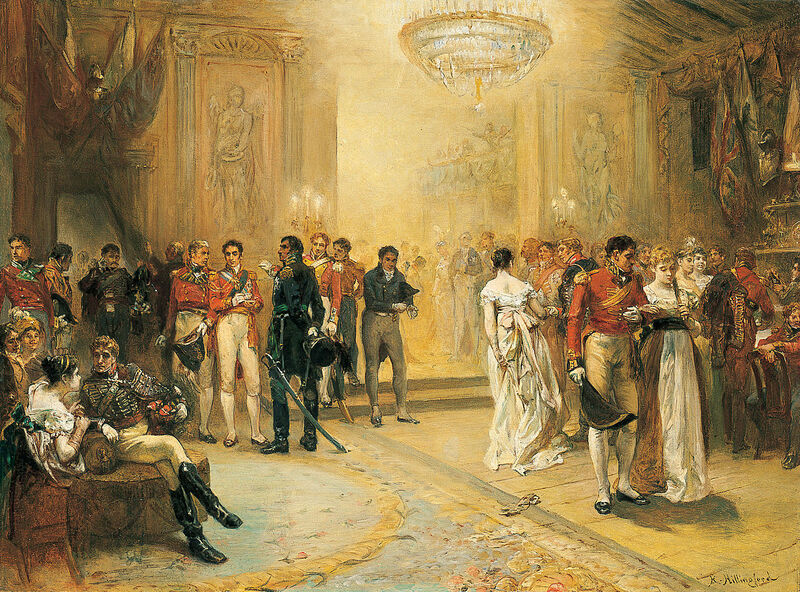 A year before their wedding, Jane had attended ‘the most famous ball in history’ held by the Duchess of Richmond in Brussels on 15 June 1815, the night before the Battle of Waterloo. It is said that Jane danced with the Duke of Wellington. Born in 1798, she died in 1901 aged 103. 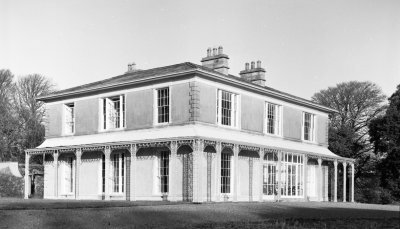 Woodstown remained in Carew hands until 1903 when it was sold to Edward Alphonse Winston Barron. He asked the architectural firm of Ashlin and Coleman to make proposals for alterations and additions to the house, a somewhat unusual choice as the practice was almost exclusively known for its Gothic ecclesiastical works. George Coppinger Ashlin was a son in law of Augustus Welby Northmore Pugin, the Gothic revivalist par excellence, and formed a partnership with Pugin’s son, Edward, in 1861. Pugin and Ashlin eventually became Ashlin and Coleman in 1903. The choice of architects might however be explained by the fact there was a Barron family connection to the firm. Sir Henry Page Turner Barron, Edward’s first cousin, had employed Pugin and Ashlin to work on Ferrybank Catholic Church, in Co. Waterford. 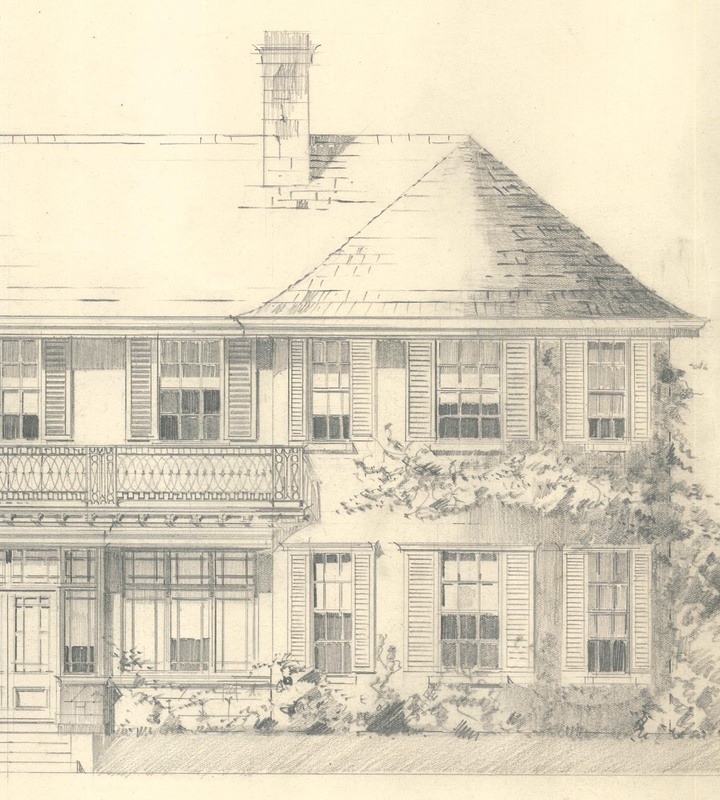 Ashlin and Coleman proposed a Classical re-rendering of the façade of Woodstown, and the additions of a gallery, a library with neo-Celtic decorations and a new billiard room. 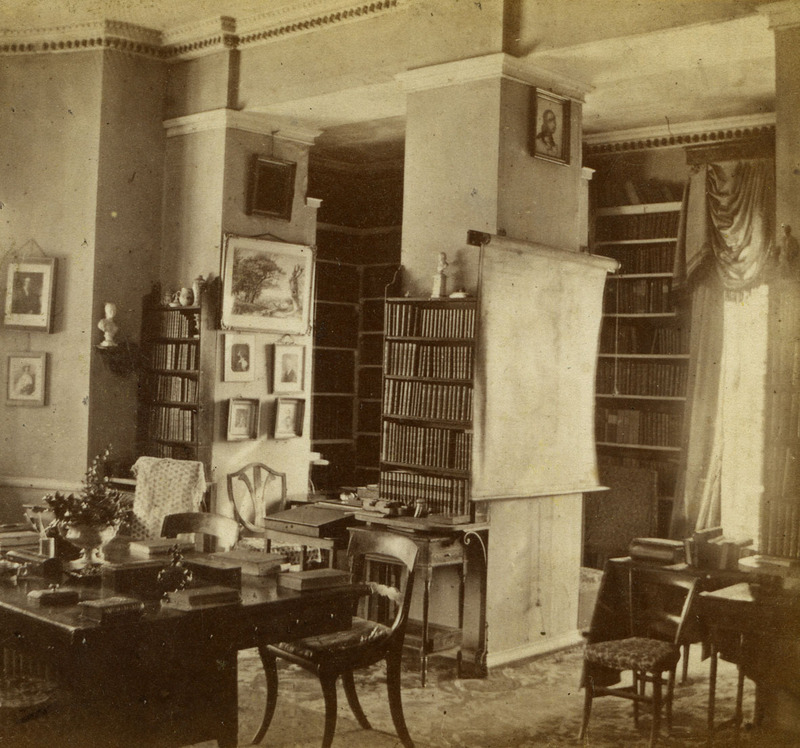 Top lit, with deep upholstered settees and a convenient lavatory, this would have been a distinctly masculine space ideally suited to the military man and bachelor which Edward Barron was. As it happens, none of Ashlin and Coleman’s proposals for Woodstown were executed. In 1945 the house was purchased by Major Dering Cholmeley-Harrison who later owned Emo Court, Co Laois. 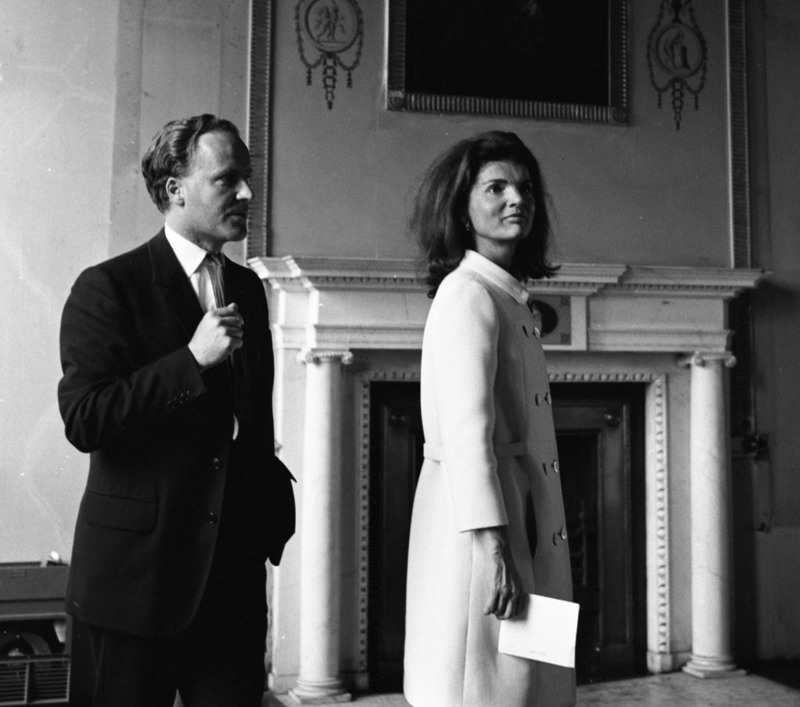 In 1967 he let Woodstown House to Jacqueline Kennedy, widow of the assassinated US president. During her stay she described it as ‘typically Irish — 39 bedrooms and one bathroom’. 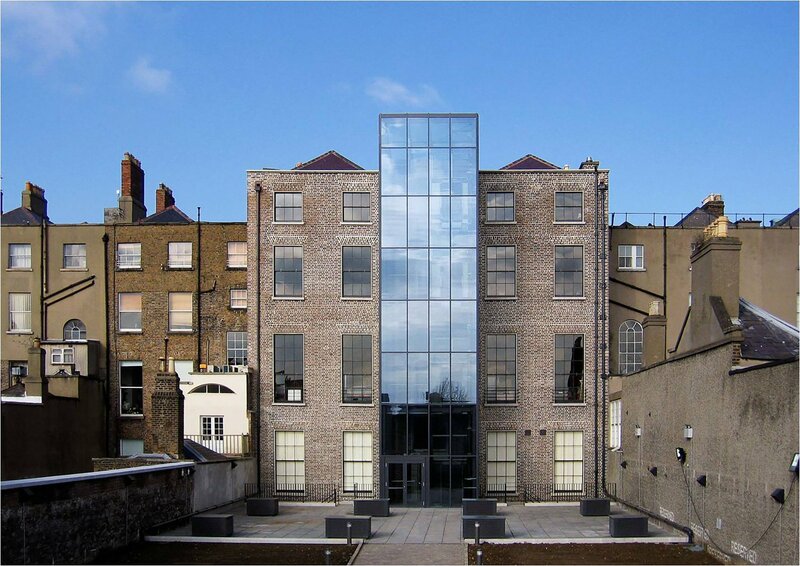 The architectural practice of McDonnell and Dixon was formed in 1917 by Laurence Aloysius McDonnell and William A. Dixon and based at 20 Ely Place, Dublin. Both men were born in Dublin. McDonnell served his articles with J.J. O’Callaghan, while Dixon was trained by McDonnell before becoming his partner. The practice still continues today at the same address. This residence for Mrs Bagwell is a charming Arts and Crafts influenced two-storey house in a style which might best be described as early twentieth-century British colonial. A flight of steps leads to a small terrace, demarcated by ball finials. The centrally placed entrance has large tripartite windows on either side and is surmounted by a substantial cornice which runs the width of the building and visually supports the slated mansard roof. The façade is completed by projecting bays at either end of the house, each with three sash windows embellished with shutters. At first floor level the roof is punctuated by dormer casement windows and surmounted by two fine stone chimneys. Despite the number of different window types, the façade reads as a coherent and satisfying whole. 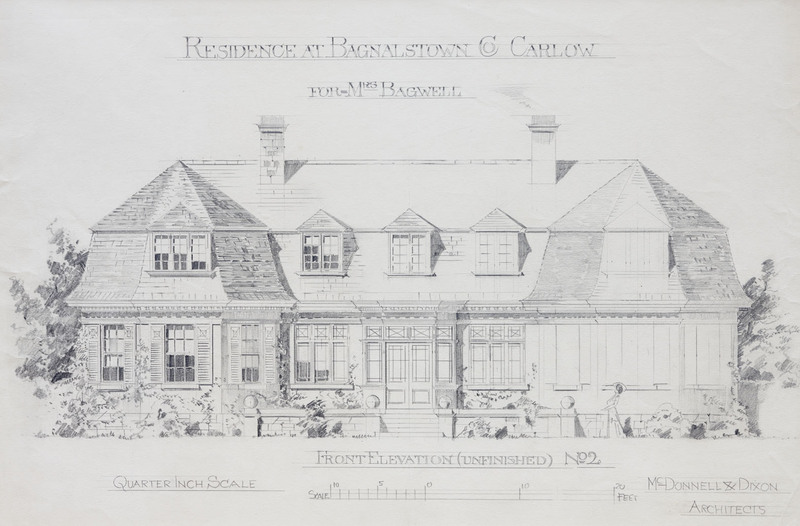 This is one of two elevations in the same hand – that of Laurence McDonnell – for a house for a Mrs Bagwell. The alternative scheme has a full-height first floor rather than a mansard roof. McDonnell and Dixon Detail of alternative proposed residence for Mrs Bagwell, c. 1920. 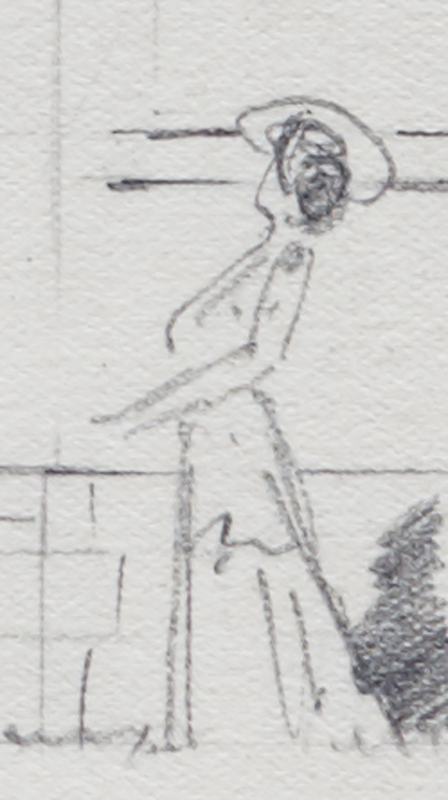 The drawing is unfinished but includes the lone figure of a woman in a long skirt, a portrait perhaps of the otherwise yet-to-be-identified Mrs Bagwell. Unfortunately it has not been possible to identify the house or to say if either this, or the alternative scheme, was ever actually built. Victoria Castle is situated on a rocky outcrop overlooking Killiney Bay, Co. Dublin, ‘as commanding and beautiful’ a site, according to the Dublin Penny Journal of 1841, ‘as could possibly be imagined’. Probably designed by architect Sandham Symes for Robert Warren, a property speculator who had made his fortune by selling parcels of land to the then emerging railway, it sits alongside Warren’s other developments of Mount Eagle and Killiney Castle. 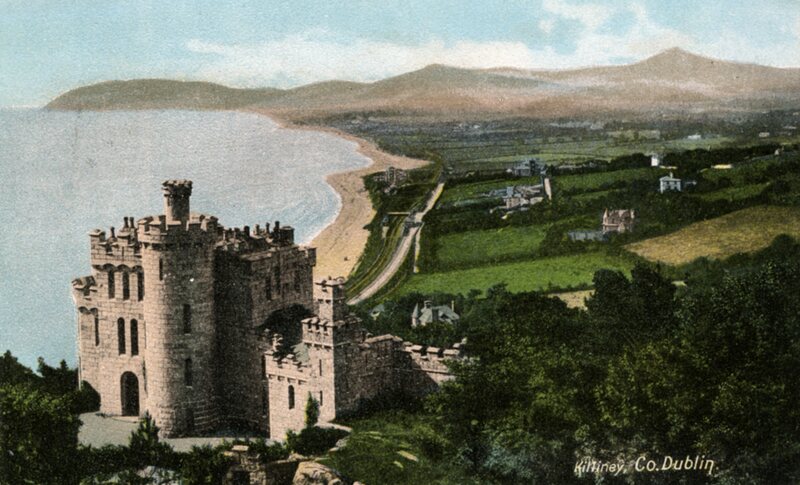 Failed speculation prompted the sale of Victoria Castle, and most of Warren’s other interests in Killiney, in 1870. 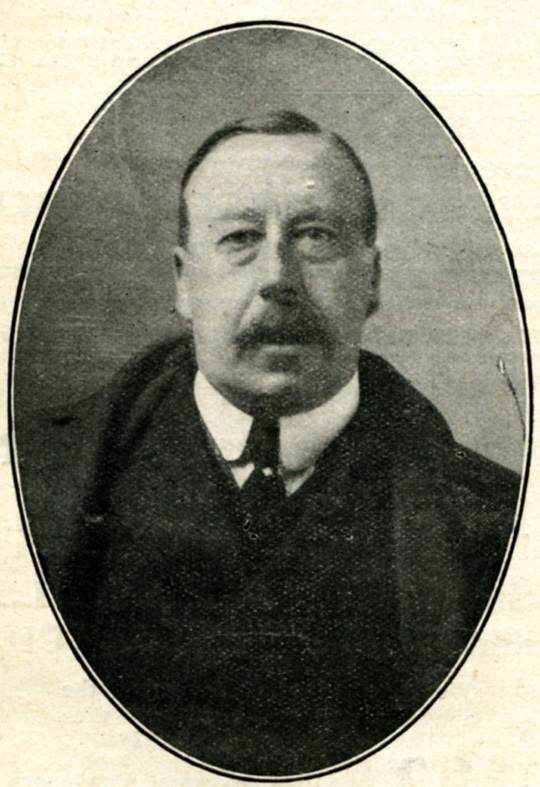 Humphrey Lloyd, Provost of Trinity College, acquired the house at the cost of £5,000, becoming the first of a succession of owners over the next fifty years. In the mid-1920s an unexplained and calamitous fire gutted the house. 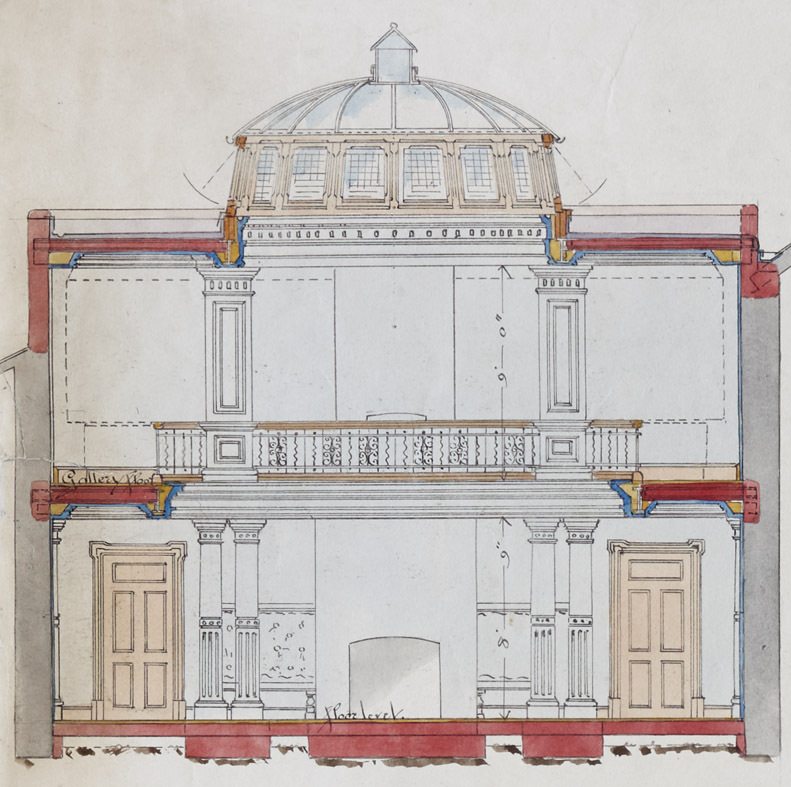 A watercoloured dyeline elevation in the Irish Architectural Archive is evidence of the building’s restoration in 1927-8, a project undertaken by its new owner, the wealthy Sir Thomas Talbot Power of the whiskey dynasty. 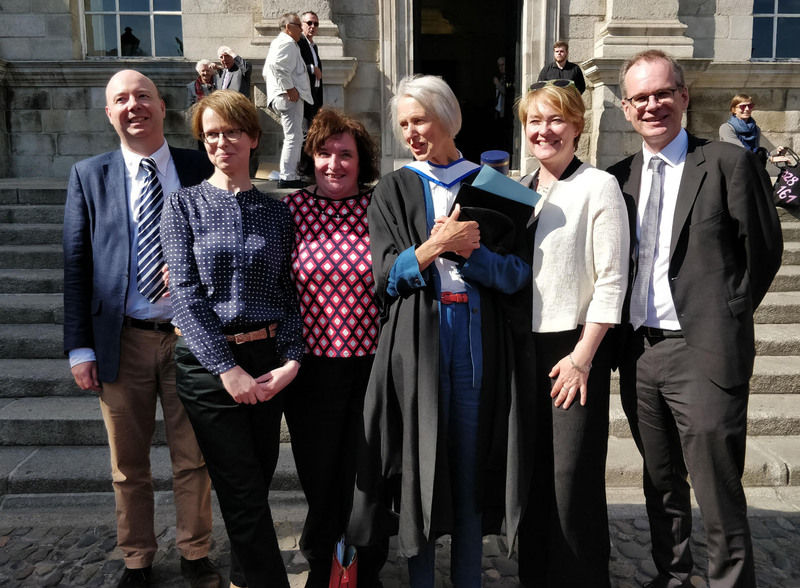 He availed of the architectural services of Ralph Byrne of W. H. Byrne and Son, a prolific office best known for its extensive ecclesiastical portfolio. The cost of the restoration amounted to £5,540 and the works were completed in six months by contractor G. and T. Crampton. 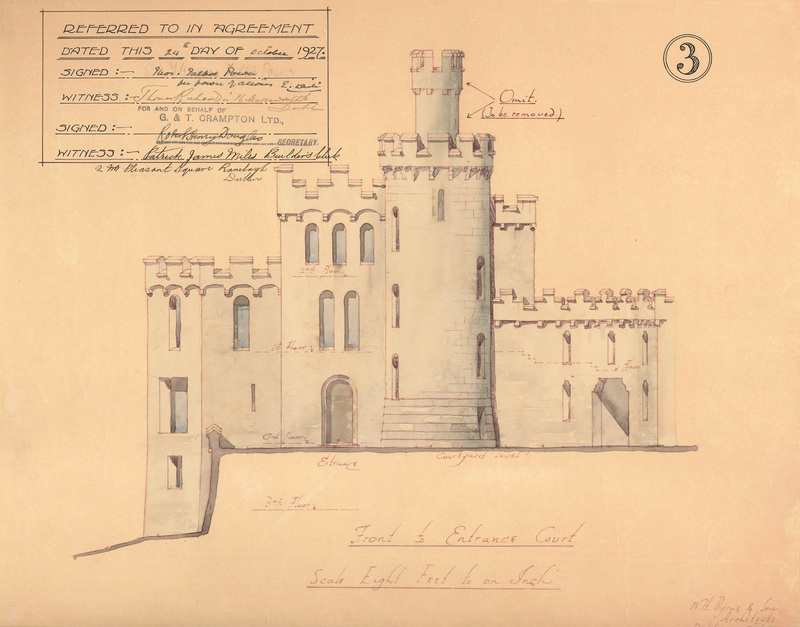 A comparison of this elevation of the courtyard façade with photographs of the castle prior to 1928 shows that while Byrne retained much of the character of Syme’s castellated Dalkey-granite pile, he simplified its appearance and modified its tower. After the restoration, the house acquired a new name, Ayesha Castle, after H. Rider Haggard’s sorceress, the original ‘She-who-must-be-obeyed’, who rises from the flames in his popular 1887 novel She. It remains in private ownership, and was renamed Manderley in 1997. Richard Lovell Edgeworth, Anglo Irish politician, writer and inventor, inherited the estate of Edgeworthstown, Co. Longford, in 1782. 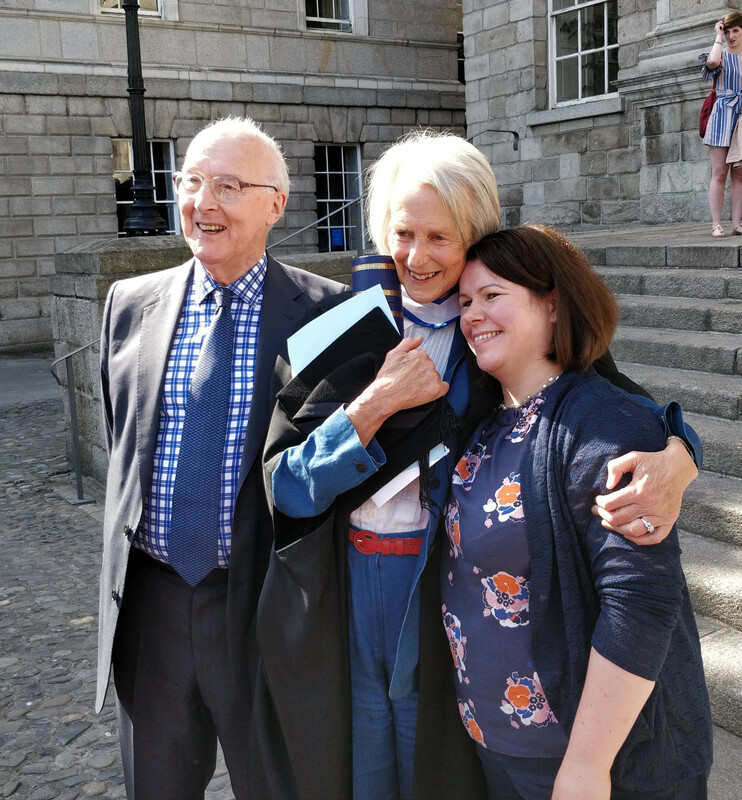 He moved with his family from England and, in the words of his eldest daughter, the novelist Maria Edgeworth, ‘the very day after his arrival he set to work and continued perseveringly, fencing, draining, levelling, planting’ to improve the demesne. Over a course of years from 1782 to 1812 Edgeworth also made extensive alterations and additions to the old house, according to his own designs, in order to make a comfortable residence for a large family. (He married four times and fathered twenty-two children.) The remodelling was extensive and resulted in a house with a particularly idiosyncratic exterior. The Archive holds a small collection of material relating to Edgeworthstown, including a number of watercolours which are attributed to Lucy Edgeworth, a daughter of Richard’s fourth wife Frances Anne née Beaufort, and his twentieth child. 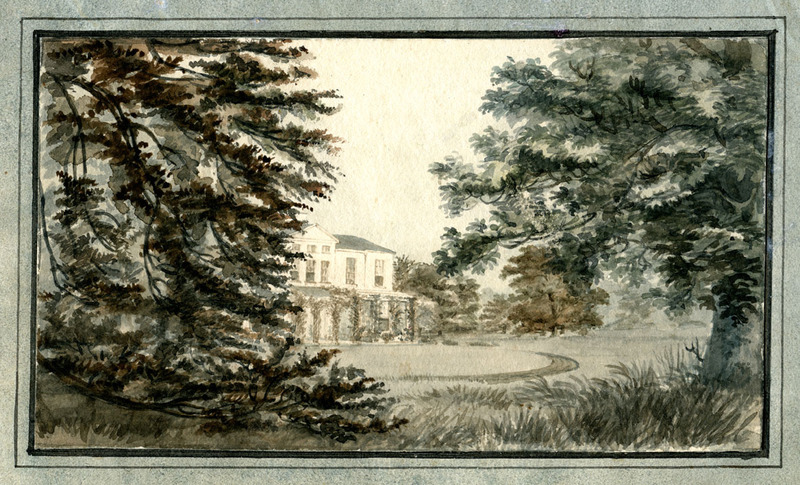 One watercolour view shows the south front of the house as it stood in 1825, viewed through the by-now well established trees. A central veranda is clad in a creeper which also covers the three bay extension to the right, added in 1807 to create additional space for the library. 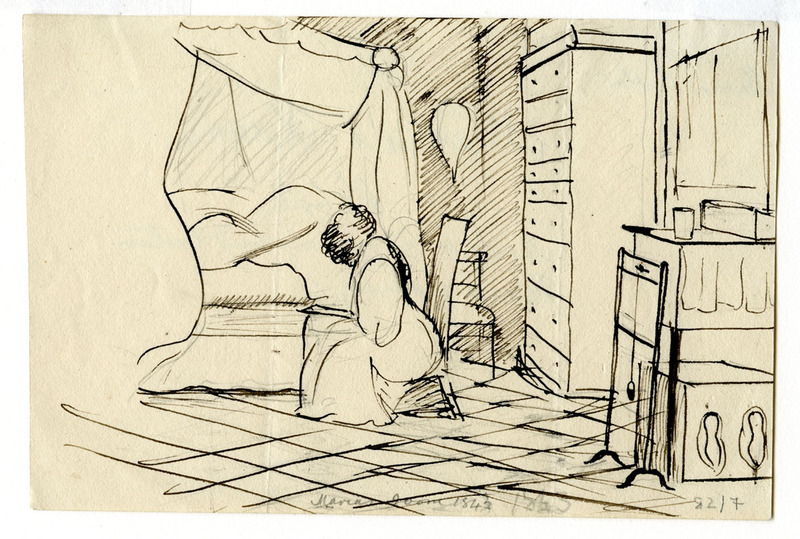 A second drawing is a pen and ink sketch entitled ‘Maria’s room’; it is inscribed on the rear as being of ‘Maria in bed, face behind curtain, Harriet [Lucy’s full- and Maria’s half-sister] reading’. This sketch is one of a small set of interior scenes which were apparently made by Lucy shortly before she left the family home to be married in 1843. It is an intimate study providing an insight into the very private space of the by then seventy-five year-old much-published novelist. Maria’s bedroom was famously small. Even after her father extended it in 1812 by the addition of an oriel window, the room measured a mere ten feet square. The addition of the new window ‘gave great additional light and cheerfulness’. Unfortunately, however, it was not one of Richard’s better designs: badly built, the window fell out before the end of the century. It is remarkable to see in Lucy’s drawing the amount of furniture which could be accommodated in the small space: the capacious tent bed, the very tall tallboy, at least two chairs, and what appears to be a washstand. 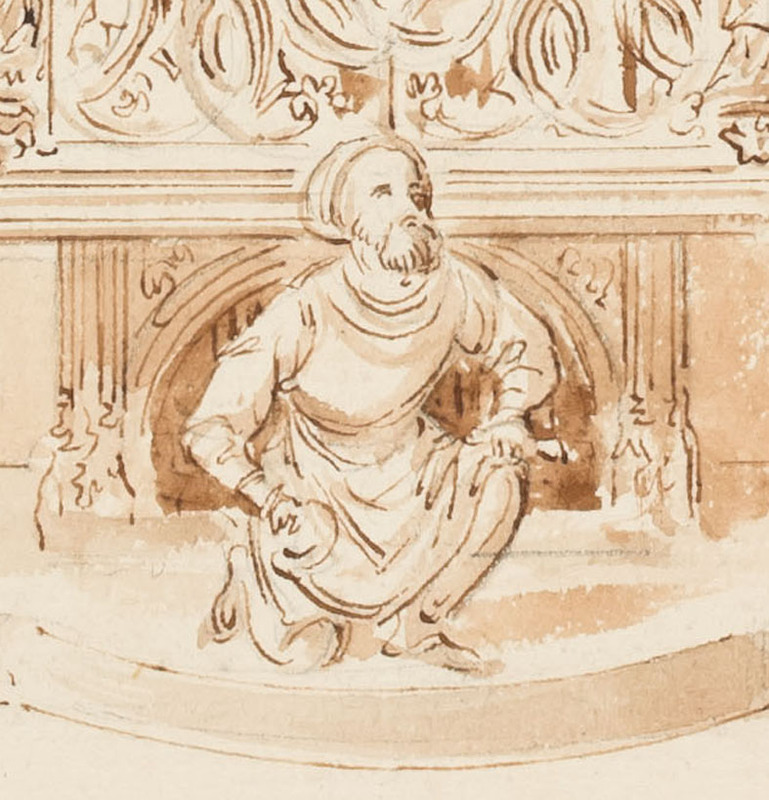 The sketch also includes tantalising items we cannot fully identify such as the object in front of the washstand: is it an embroidery or tapestry screen, or could it be some novel creation of Maria’s ever inventing father? 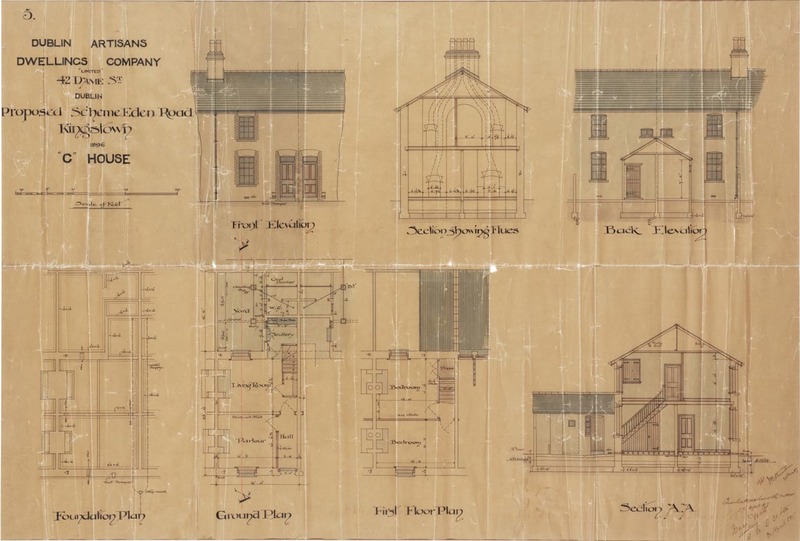 House and Home is the title of the Irish Architectural Archive’s fortieth anniversary exhibition and a short series of blogs, beginning with this one, will explore some of the material in this exhibition. One of the most curious items in the entire Archive collection is an engraved topographical view ostensibly showing a grand Irish house – the maison de plaisance, no less, of the Archbishop of the Province of Munster. Although the imprint information is missing from this copy of the engraving, it was originally produced in Paris between c. 1750 and c. 1770 by Jacques (or James) Gabriel Huquier. Known as Huquier fils, he was an engraver, print dealer, wallpaper manufacturer and portrait painter. It is an example of a vue d’optique, a genre of engraving intended to provide the illusion of depth when viewed through a device known as a zograscope or diagonal mirror, hence the image was printed in reverse. 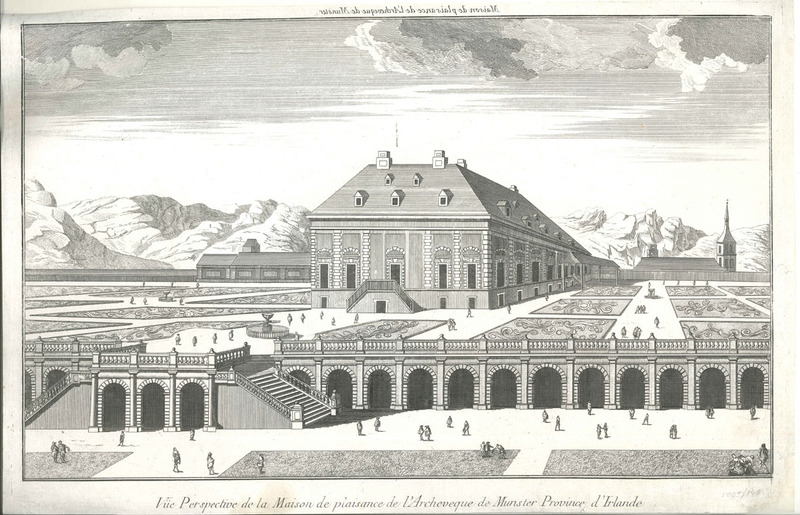 Huquier fils produced a number of topographical vues d’optique depicting buildings in Austria, England, France, Germany, Spain and further afield. Most vues d’optique were brightly tinted after printing to enhance depth perception, although this example was not. Beyond these facts, matters are less straightforward. From the steeple of the church in the background to the arcade supporting the terrace with its extensive formal gardens, to the mansard-roofed palace building itself, nothing in this view is remotely Irish. What of the Archeveque de Munster? There is not now, nor has there ever been, an Irish cleric with the title ‘Archbishop of Munster’. The closest equivalent is the Archbishop of Cashel and Emly who from 1754 to 1779 was Michael Cox, builder of Castletown Cox, Co. Kilkenny. It would be nice to think that this is a notional French fantasy of what Cox’s proposed new house might look like. 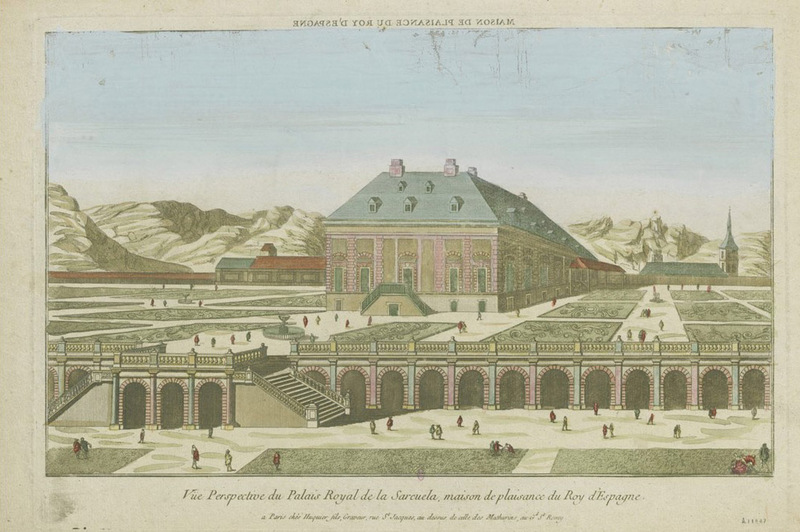 But no, a copy of the engraving in the Bibliothèque Nationale de France bears its true title: Vue Perspective du Palais Royal de la Sarcuela, maison de plaisance du Roy d’Espagne. 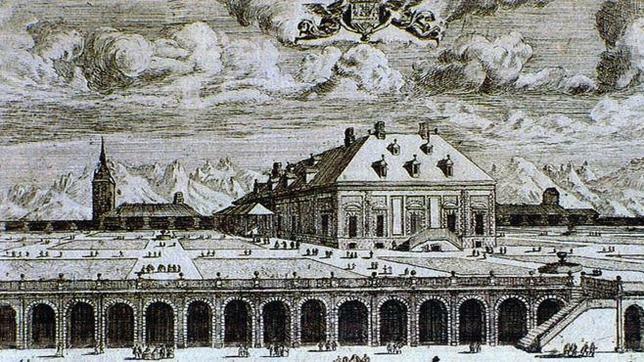 It is in fact a copy of a 1665 engraving by Louis Meunier of the Zarzuela Palace, Madrid. When, where, why, and by whom was the engraving reprinted with a new title and an Irish location? Answers to those questions remain to be found.